Today, Facebook is launching a new “Live Stream Box” feature which allows for Facebook Pages to offer their own live video and chat area. And Ustream will be the first to take advantage of it with Ustream on Facebook, a new service to provide live video support to select Facebook users. So clearly, there’s a big demand for certain live events via Facebook, and Ustream is jumping on it, as Facebook’s preferred partner. Today, Facebook is launching the Facebook Live Stream Box as a feature that any website owner or developer can use to enable Facebook users to connect, share, and post updates in real-time as they witness an event online. Websites can run the Live Stream Box next to live streaming videos of concerts, speeches, sporting events, webcasts, TV shows, presentations, or webinars. 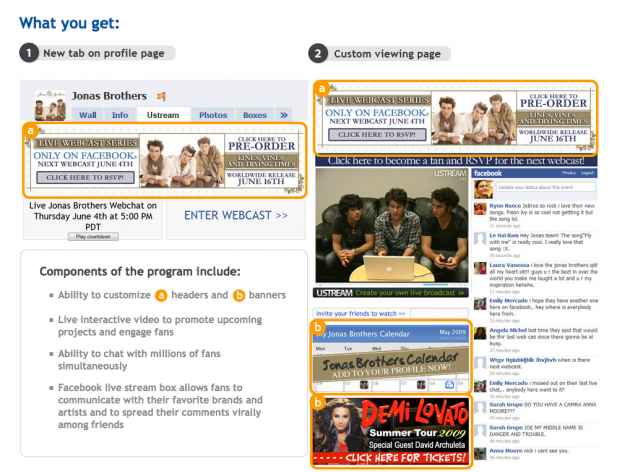 Sites can also run the Live Stream Box in multi-player games, or with any other experience where many people are visiting a website at the same time. But Ustream’s funtionality is not for everyone yet, due to what will undoubtedly be high demand, we’re told. Any artist or person who thinks they could benefit from the Ustream functionality, can apply to have the feature turned on here. With it, you’ll get not only the live player, but a customizable banner that can link to places like iTunes or Amazon (obviously important for artists). Right now, there are two versions of the player: A free ad-supported version, and a white-label version. The free version is the one with limited sign-ups allowed right now, so click that link above quickly if you think you need the feature. The white-label version comes with a one-time development fee of $15,000. But you also get an ongoing subscription to Ustream’s white-label platform, Watershed. Find out more information here. 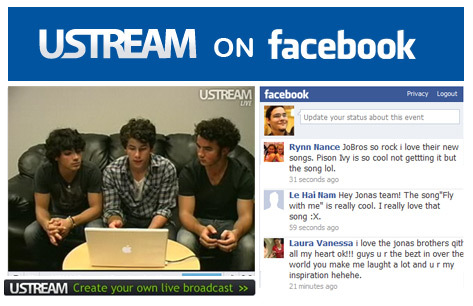 Eventually, Ustream hopes to port this Facebook experience over to its main site as well using Facebook Connect, we’re told.